Y si os quereis quedar a dormir por allí, también alquilan apartamentos...en el mismo estilo "abuela elegante", claro! Para llegar hasta allí...Muy fácil. Está justo en la carretera que bordea el lago, enfrente de un hotel muy grande (cuyo nombre no logro recordar) y detrás hay un pequeño centro comercial. 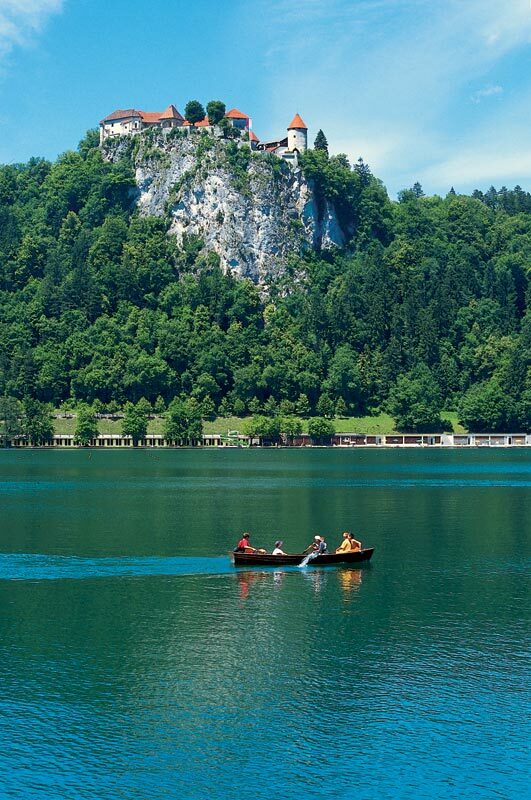 Well, you have arrived to Bled. Now, you must eat...You SHOULD go to Peglez,n, a fantastic place. 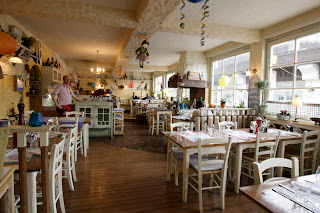 I love its style and its food is really good. I can remember they had italian and slovenes plates and something like mexican, and any meat and fish. 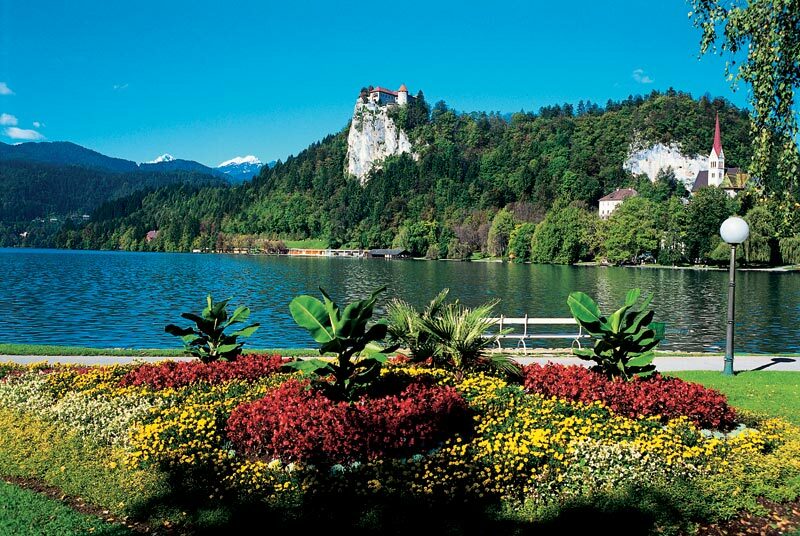 And If you want to stay in Bled, they also let appartments...in the same "elegant grandma" style! 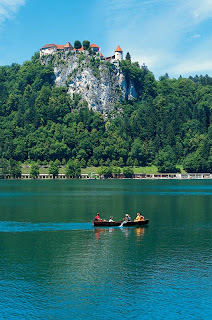 Vuelvo al blog con Bled, uno de los más típicos lugares en Eslovenia. Se trata de un lago de origen glacial que da lugar a un idílico paisaje. Bordeando dicho lago el pueblo, también llamado Bled. En el centro del lago, una islita con iglesia incluida, y en una atalaya a un lado, el castillo. Clima: La presencia de los Alpes Julianos refugia a la zona de los fríos vientos del norte, permitiendo un clima "algo más suave" de lo esperable. La media mensual en verano es de 19º (fresquito, vaya) y en invierno casi -2º. Alojamiento: En el pueblo podemos encontrar varios hoteles para todas las economías, algunos de los más lujosos tienen balnearios en su interior (recordemos, la joya de Eslovenia). Llegar: Desde Ljubljana se llega en 1 hora, además, es autopista la mayor parte del camino. Pero también está muy bien comunicado mediante tren y autobús regular. 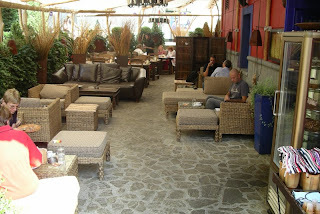 Mañana...reseña sobre el restaurante maravilloso donde comimos en nuestra visita a Bled. 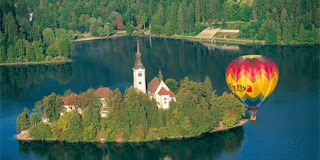 Im coming to the blog with Bled, one of the most typical places in Slovenia. It's a glacial lake that gives rise to an idyllic countryside. 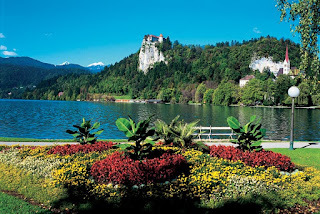 The town also called Bled rounds the lake, and in the center there is a little island with a hermitage, and in the vantage point, the castle. Weather: The Julian Alps protects the zone from the cold north winds, allowing then a "softer" weather...The average monthly temperature in July is 19°C and in January -1.7°C. Acommodation: In the town we can find some hotels for every kind of economies. The most luxurious have thermal waters inside. How to get: It takes 1 hour from Ljubljana, by a very good motorway. But you can also get there by train or regular bus. 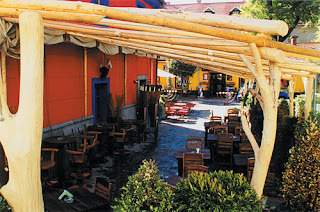 Cantina Mexicana, a recommended restaurant if you like mexican food. 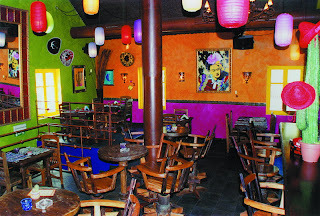 Decoration is beautiful, mexican pop, i would call it! 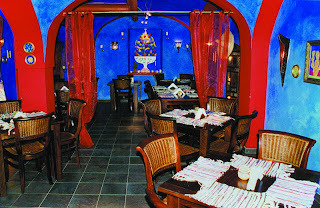 And a perfect situation, in the whole center (Wolfova 4), in a place beautiful. 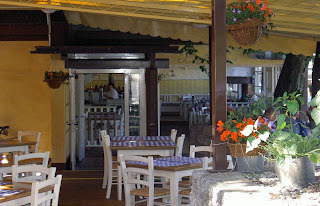 We used to go often and we had very good luck because good weather allowed us eating in the terrace. But you must see it inside. Lo he encontrado en un blog en internet, es muy gracioso. Son una serie de mitos acerca de los eslovenos. Siempre un poco exagerado eh? (varias frases sobre el alcohol) Y que conste que el autor es un esloveno! :) No se me ofenda nadie, por favor! I have found it in a blog, and it's very funny. They are a list of topics about slovene. A little exaggerated, but it has something of true :-) A Slovene is its author, I took it from here. 1. Šlivo cures everything from a stomachache to paper cuts. 2. You are well acquainted with “sarma”. 3. You eat everything with “ajvar”. 4. You think mixing Coke and red wine (bambus) is an extremely tasty drink. 5. There is nothing gross about blood sausages (krvavice). 6. Drinking with your parents is normal. 7. Your relatives, especially in Slovenija, do not believe in opening the car windows on a sweltering hot day because of “prepih”. 8. When outside of Slovenia, you fight an irresistible urge to kiss the person you’ve just shaken hands with. 9. You're not allowed to leave the house with damp hair because you're going to become bolan(a). 10. You have to wear copate around the house, even if you have carpeting and it is 95 degrees outside. 11. Your family makes their own vino, medica, or šlivo. 12. 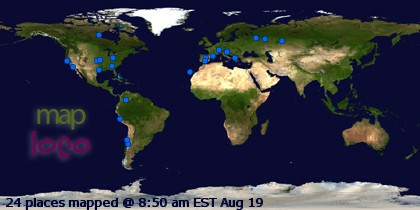 You never got to sleep in on Saturday because you had Slovenska šola. 13. Mami is always making you eat. 14. You know how to dance polka and you’re proud of it. 15. 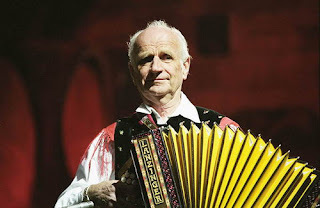 Someone in your family can play buttonbox or accordion and is always bothering you to learn. 16. You’ll still drink Cockta to please your family in Slovenija even though it makes you sick to your stomach. 17. English verbs are acceptable if used with the ending "-ati", which makes them Slovenian: "play-ati", "study-ati", “clean-ati”. 18. At the age of 13 you are only allowed to go out of town with your friends for folklore festivals, drinking binges, and dances. 19. Your parents were at the party where you first got drunk and maybe even offered you a drink. 20. Then they waited until the ride home to beat the crap out of you for getting drunk and embarassing them. 21. The majority of your friends are also your relatives, even if they aren't your relatives; because you refer to their parents as "teta" and "stric”. 22. "Kuhovnice" are not only used for stirring when cooking... they are also used by mami to beat you when there is no "šiba" handy..
23. At least once you've told your parents that you'll call the police to report "child abuse" and your parents said "Ja! Samo probaj..."
24. Lunch on Sundays has more courses than Amerikanci have for Christmas or Thanksgiving dinner. 25. Your 13 year old sister can out-drink any Amerikan'c or Irishman. 26. You love "golaž", but don't like bringing it to school or work for lunch because you'd be embarrassed if someone asked you what it was. 27. Vegetarianism is not a concept your parents understand. 28. You smell garlic or alcohol on the old man's breath behind you sitting on the pew in church on Sunday mornings. 29. You never got the "Birds and the Bees" talk from mami or ati when growing up. 30. You are only allowed to vacation in the homeland for a minimum of 4 weeks. 31. Your relatives alone can populate a small city. 32. You’ve worked in the “štale” at your relatives house in Slovenia and the cow smell didn’t even bother you. 33. You know what a "D.P" and a "Boater" are and you frequently call your parents by either derogatory name. 34. You're still laughing your ritka off because you know every single one of these are true. Yo creo que en algunos puntos se han pasado y es un poco exagerado...Pero bueno, la verdad es que si redactasemos la lista de topicos españoles tendríamos para dar y tomar y seguramente no exageraríamos...!!! Y por ejemplo, lo del vegetarianismo creo que no es nada cierto. Yo no soy vegetariana, pero lo cierto es que la comida de este tipo en Eslovenia es bastante más accesible que por ejemplo aquí en España. Para empezar, el tofu de soja vale como una cuarta parte de su precio español. I think many of the points are exaggerated...But, well,actually the spanish topic list would be longer and probably we wouldnt exaggerate anything! And what about vegetarianism. I think it isnt true at all. Im not vegetarian, but certainly this kind of food in Slovenia is more accesible than in Spain. Firstl, soja tofu costs in Spain four times more that in Slovenia. Aquí os dejo algunos videos del momento glorioso de subida a Vogel. La calidad no es muy buena pero es que al pasar de la cámara al ordenador nos pierde mucho . And by last, sight from sky-ski centre.